Here, then, is our first taste of Creative Assembly's Total War: Warhammer. It's not in-game footage—rather an "in-engine" rendered cinematic representation—but nevertheless shows an impressive amount of carnage and destruction as the various monsters, magicks and hulking meat-slabs all have at each other. It'll be an interesting shake-up of the now familiar Total War formula. 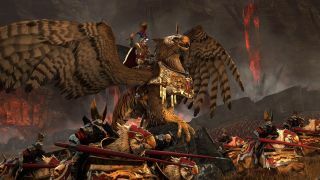 Where historical armies tend to offer specific bonuses focused around tactical archetypes, the Warhammer universe means meaningful divergence centred around the very make-up and abilities of each faction. We must now cast our eyes forward to July 30, which is the date CA will release a developer walkthrough of 'The Battle of Blackfire Pass'. It's one of the game's "unique quest battles," and will be the first public showing of the game in action. As for a release date? There isn't one yet.